Nearly all our dairy products (we may have mentioned this earlier, but we think it’s a fact worth repeating! ), come from local farmers, which means that our milk has travelled fewer food miles than most of our competition and can be traced right back to those farmers. There will be many times when the milk you pour in your coffee or your kid’s cereal in the morning, will have been “sloshing about” in the cows you saw on your way to, or even from work the day before. Of course, freshness of dairy products is only the beginning to providing good food. Our dairy products are processed to the very highest of food safety standards (BRC Global Standard, Grade A) and our milk is monitored at every stage of production to ensure it meets the strictest requirements of safety quality. Our milk comes in four varieties which you can view here – homogenised whole, semi-skimmed, skimmed milk and our latest dairy product 1% fat milk. 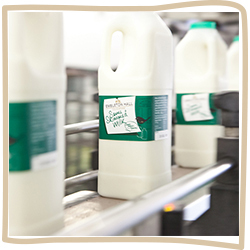 Our milk is available in a range of sizes, from 250mls to 3 litres. We can also pack in bulk, from 13.6 litre “bag in box” to 1000 litre pallecon. Pasteurisation means that the milk is heated to 72.50C for 15 seconds (although we aim for slightly higher than this) in order to kill off food poisoning bacteria, make our milk safe to drink and to make our dairy products last longer without affecting the fresh taste. For more information on this process, please click here. The butterfat of cow’s milk varies throughout the year, and is dependent on what the cows are eating and when they have calved, we aim to maintain the same butterfat for each type of dairy product throughout the year, by taking cream out of the milk, so that it tastes the same throughout the year and is not subject to seasonal variations. This is called “standardisation” and the level is set at 3.5% for whole milk, 1.5% for semi skimmed, 1% for 1% milk and zero for skimmed milk. We also Homogenise our dairy products, which means that the milk is forced through very small holes under high pressure, in order to break up the fat globules. This means that the cream will no longer separate from the rest of the milk and give an unsightly “cream line” on the bottle.For more information on this process, please click here. Visit the Dairy Council's website, it has everything you need to know about milk and dairy products.